고려시대의 만들어진 청자 매병으로 높이 31.1㎝, 아가리 지름 4.4㎝, 밑지름 11.4㎝이다. 밖으로 약간 벌어진 짧은 아가리에 어깨부위는 둥근 원을 그리고 있는데, 고려시대의 전형적인 매병보다 어깨가 좁고 둥글어 날씬한 모양을 하고 있다. 유약은 담청색을 띠는 투명한 유약으로 미세한 기포가 포함되어 있어, 약간 반투명한 효과를 보인다. 문양은 일반 매병으로는 드물게 어깨와 몸통, 아랫부분에 연꽃무늬가 둘러져 있다. 어깨부위와 몸통부분에는 백토와 흙토를 이용하여 상감기법으로 무늬를 넣었고, 그 사이의 공간에는 3줄의 세로줄무늬를 5곳에 두었다. 아랫부분은 흰색만을 이용하여 연꽃무늬를 넣었고, 위와 마찬가지로 몸통과 아랫부분의 무늬 사이에도 3줄의 세로줄무늬를 4곳에 넣었다. 매병의 상감문양으로서는 단순한 소재의 선택과 단순한 구도가 특징적이다. Dating back to the Goryeo Period, this celadon prunus vase has height of 31.1 cm, mouth diameter of 4.4 cm, and base diameter of 11.4 cm. Its mouth is slightly opened outward, with the shoulder forming a round circle. 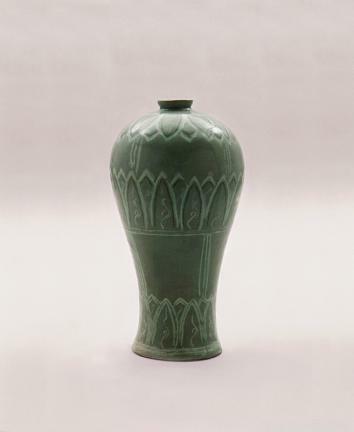 Its shoulder is narrower and rounder than that of a typical prunus vase dating back to the Goryeo Period. Therefore, this piece looks rather slender. The clear light blue glaze contains tiny air bubbles that make it slightly translucent. There is a band of lotus flower design around the shoulder, main body, and lower body, which is unusual for typical prunus vases. The designs on the shoulder and the main body are made using the black and white inlaying technique. Three stripes of vertical lines are placed on five different places in the space between the designs. The lower body is decorated with lotus flowers only in white; in the upper area, three stripes of vertical lines are placed at four different places between the main body and the lower body. The distinctive features of inlaid designs on a prunus vase include the selection of plain objects and simple composition.